High torque, hollow shaft servo actuators with direct drive motor performance in an extremely compact size. 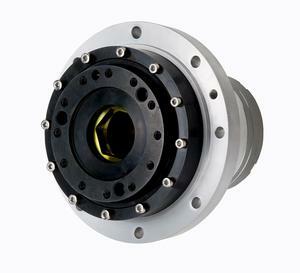 The SHA-CG offers superior rotary positioning accuracy and an output flange with a surface run-out less than 10 microns. The SHA-CG actuators feature a compact, hollow shaft configuration for design versatility in demanding applications. Ideal for machine tool applications, the SHA Series of brushless actuators provide high torque for fast acceleration and positioning. SHA-CG actuators are composed of a Harmonic Drive® CSG zero-backlash gear combined with a brushless servomotor with an encoder resolution at the output up to 20,971,520 pulse/rev. The actuators are also available with an optional brake. Positional accuracy better than 1 arc-min and repeatability better than ±5 arc-sec is achieved while delivering up to 3,400 N m of torque. A robust cross-roller bearing allows mounting of large loads directly to the actuator without the need for additional support. The SHA-CG has a Torque to Weight ratio as much as 8 times greater than comparable housed direct drive motors, and a Torque to Volume ratio as much as 6 times greater. This allows for a more compact and light-weight machine design. Known for its expert engineering and manufacturing, Harmonic Drive LLC products are relied upon every day throughout the manufacturing community.